ANTHONY FOOKE. We have traced the Fookes of Bishops Nympton back to the 16th century. Bishops Nympton is a large North Devon village to the east of South Molton. It is close to the southern border of Exmoor. Baptism. St Mary the Virgin. Bishops Nympton. Anthony was the second of the six children of Henry Fooke and Peternell Blakemore. His mother appears to have come from, or be related to, one of the leading families of Bishops Nympton. His father’s origins are more humble. Henry Fooke does not appear in either the Muster Roll of 1569 or the tax assessment for 1581, giving the impression that he may have been disabled, with a low income. Earlier generations of Fookes also appear to be at the lower end of the economic scale. REBECCA LANEMAN. Since Rebecca and Anthony married in Rose Ash, we assume this was her home parish. We would estimate a birth date for her around 1570. Since the Rose Ash registers only go back to 1591 we shall not find her baptism. There were other Lanemans of her generation in Rose Ash, who may be siblings or cousins. Although we do not have a record of her parents in the Rose Ash register, there is a promising marriage in Bishops Nympton in 1559 for John Laneman of Aisheraphe (Rose Ash) and Johane Blakemore. John Laneman would have taken Johane back to Rose Ash to raise their family. These may well be Rebecca’s parents. Anthony’s mother was Peternell Blakemore of Bishops Nympton, so Anthony and Rebecca could be cousins. Alternatively, her father could be Richard Laneman. John Laneman appears in the 1581 tax assessment for Rose Ash charged for land at £2. There is also a Richard Laneman, charged for goods at £3. Ownership of land would carry social status. The assessment for Richard Laneman puts him below the average for the parish, but not among the lowest. Rose Ash is three miles SE of Bishops Nympton. 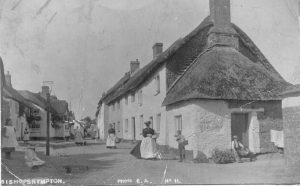 The couple made their home in Anthony’s parish of Bishops Nympton. We have found the baptisms of six children, but the register is damaged, so there may be others. The births were twice attended by tragedy. Baptism. St Mary the Virgin, Bishops Nympton. 1610 July 21 A chrisomer man child of Anthonie ffooke and his wife Rebecca was buried. A chrisomer child was originally one buried in its baptismal robe, but the name came to be used for an unbaptised child. We have not found the burials of either Anthony or Rebecca. These may have been on a damaged page of the register. They lived through a large part of Elizabeth’s reign and on into the Stuart dynasty. BMDs from parish registers on Findmypast.